St. Paul is another one of the powerhouse catholic churches. It's huge, modern, and yet, very welcoming. The church started back in the early 1980's but it was redeveloped into the larger church back in the late 1990's. It is located close to the downtown of Chino Hills near the new outdoor shopping mall. St. Paul stands out due the wonderful architecture and close proximity to parks, and excellent reception venues. It's an ideal location for those planning a wedding where people are coming in from San Diego, Los Angeles, Orange County and the Inland Empire. Chino Hills really is the heart of Southern California. I would love to say that they give special attention because Lifetime Images is located in the same city, but their warm, caring nature is more indicative of the type of church it is and the people associated with it than our common geography. If this church was a coffee it would be considered a blend. There are many elements of modern catholic church similar to Our Lady of Angels, and Holy Mary, and yet so much of the older style of Catholic church that have been around for the past thousand years if not longer. So, if two words could sum up the church it would be modern and familiar. This church is also very large, almost as large as Our Lady of Angels. It has a very nice courtyard which is excellent for photography. If there isn't enough greenery for your liking, some of the best parks in the area is only five minutes away. Of course, by being located so close to this church, I also know where some hidden gems are located which would make excellent settings for portraiture. This church is very friendly to photographers. There are better photographic opportunities at this church compared to other catholic churches just by being more receptive to photographers' needs. Some things to be aware of is that since the church is so large and spread out even if you invite 500 people to your wedding it can have the tendency to look empty as people spread out. Also the stain glass pushes the orange hues which can be adjusted out of the images in post processing. We can tell you first hand after living in Chino Hills for the past 15 years that this place can get very hot in the summertime. The good news is that their air conditioning works well, But if you choose to take pictures on the outside courtyard it can get hot. As mentioned previously, there isn't a lot of greenery to be found around this church, no rose gardens or waterfalls either. English Springs park which is down the street now has police officers combing the park writing tickets to weddings, teams and other parties that use the park for photography. I've been very vocal against this move, and I am waiting for the day they write me a ticket because I will be at the next city council meeting asking them why they want to prevent me from using the city parks for photography when they have no problem taking 1% of the sales tax revenue my business has generated for them over the past decade for the city. If we run a legitimate business with a business license, 1 million dollars of business insurance with the City of Chino Hills on the rider, and a city of Chino Hills business permit, then what's the big deal? This is a nice, large Catholic church, with a very friendly staff. They are warm and welcoming. 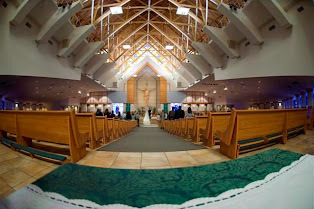 The church is easy to get to, and also very popular, so if you are looking for a good sized Catholic church in the area, check this out first and make your reservation while you still can. If you are from out of the area you may want to check out St. Denis and Holy Mary on the same day. These are three very nice Catholic Churches. Though St. Denis is a little prettier I like the other two church a bit better because they aren't as busy. They do a lot of weddings on a Saturday at St. Denis, whereas the other two churches aren't as busy. Of course, the benefit of getting married in Chino Hills your marriage will have an extra blessing because Chino Hills is the new promised land!